I need to send multiple document by JobSubmit Request ? I am adding multiple document in DocumentType array and sending it for fax . But fax is generating for the document attached on the last index of array. Please help me how can I get multiple fax with one job submit request. On line no 318,319,320 its setting DocumentType array in JobSubmitRequest Object. Please check my code as attachment. How can we send fax of multiple document with same job Id. I am waiting for reply. I need to send multiple type of document like doc, docx, xls, xlsx. Please suggest me the solution. Attached are two sample requests, each containing multiple documents. First, fax_multi_doc_DocumentSet: Using a DocumentSet allows you to define and send multiple messages within a single job request. Each Part element contains a DocRef tag that points to a document defined within the DocumentSet. Second, fax_multi_doc_inline: Multiple documents can be defined inline within the Contents element. In both instances, a Treatment tag must be used with multiple documents; one document will be treated as the body, and all subsequent documents should be treated as an attachment. 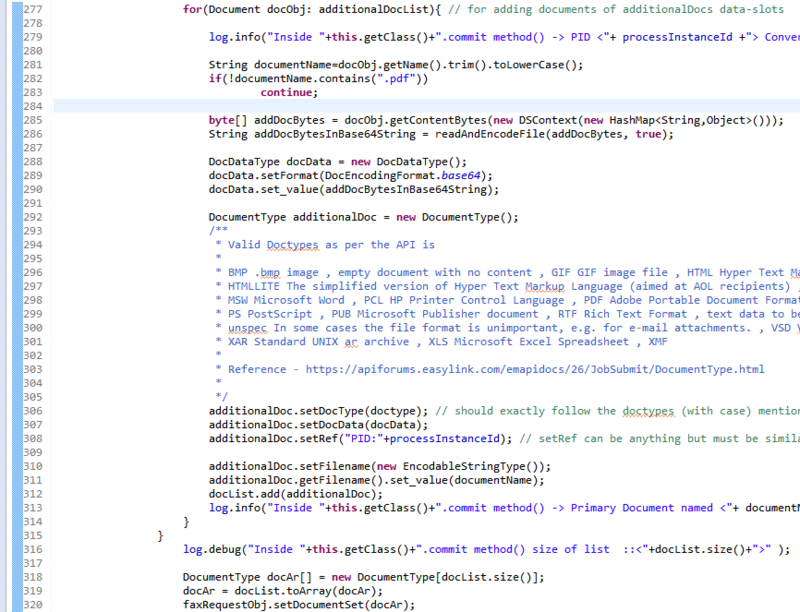 Attached is another sample with base64-encoded inline documents.